I used to be tough. Or, at least, I thought I was tough. Not physically, of course (I mean, have you seen my bird arms?). But in a verbal argument, I could hold my own and then some. I was like a Kung Fu master where my words were like combination kicks and my tone the serpentâ€™s teeth sharp enough to reach the marrow of the bone. Recently, in womenâ€™s bible study, I tried to explain this, calling my outbursts â€œverbal vomit.â€ I certainly wouldnâ€™t have called them that at the time. I would have said something like I was quick-witted or sharp-tongued; you know, something that had a more positive connotation. Because I took pride in my ability to â€œput someone in his place.â€ Yeah, pride. It seemed as if I spent most of my time looking for a fight, looking for something to get riled up about. And I was angry all the time. I was like Mark Ruffaloâ€™s Hulk, ready to morph into an oversized green rage monster on the turn of a dime. You see, anger was an easier emotion to deal with; it was like a balm or seal over feelings that would otherwise be hurt. Iâ€™ve been changing for awhile, and Iâ€™m different now. Iâ€™m not tough. Or rather, Iâ€™m not tough-hearted anymore. Â And I cry a lot more. And Iâ€™m okay with that. Some may say this is due to age â€“ maturing, mellowing out â€“ or ample anxiety medication, but I say by the grace of God, I am different. â€œLet love and faithfulness never leave you. Bind them around your neck. 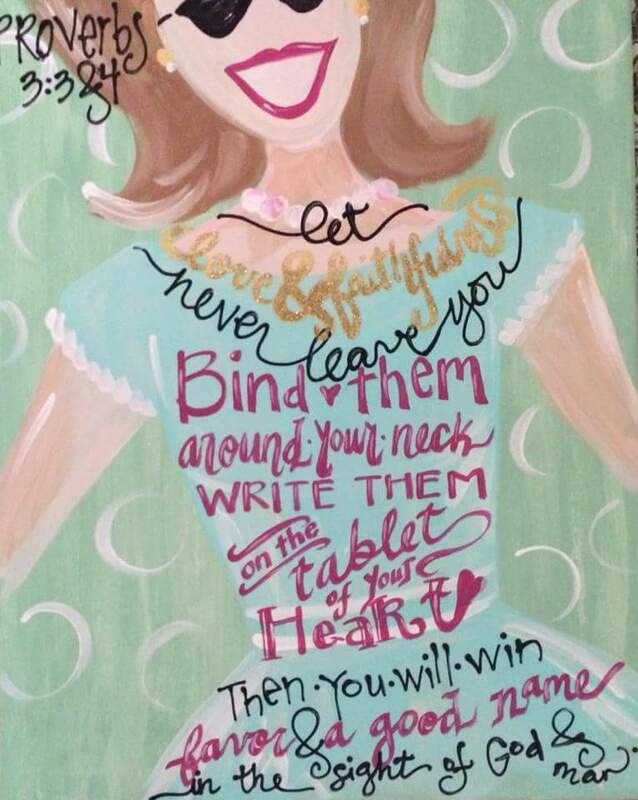 Write them on the tablet of your heart. Then you will win favor and a good name in the sight of God and man.â€ (Proverbs 3:3-4). I feel like she painted it on my heart. I recently had a run-in with someone. I wasnâ€™t expecting a difficult conversation; in fact, Iâ€™d called to apologize for something. But before I knew it, the conversation took an ugly turn. Rather than responding in anger (which certainly would have been the 20-year-old meâ€™s response), I felt sorrow. Sorrow for the original thing Iâ€™d called to apologize about; sorrow for the words that were cutting through me and the relationship; sorrow for anything else that may be going on in the other personâ€™s life to cause such vehemence; pure sorrow. My heart hurt. And rather than lash back, I ended the call. And I cried. Cried for me. Cried for the other person. Cried for the situation. And every time I started to get angry, I cried more. Iâ€™m tearing up now just writing about it. Years ago, I would have called myself a baby. Now, Iâ€™m thankful for the tears, because theyâ€™re evidence of my heart which, above all else, should reflect God. Of course, I still mess up sometimes, lash out, spout off things I wish I didnâ€™t. But, Iâ€™m better than I was; and Iâ€™m constantly trying to be even better. Iâ€™m claiming that â€œimperfect progress.â€ Godâ€™s love and faithfulness have bound my heart (and my mouth, praise Him!). And like Tannerâ€™s painting (of which Iâ€™ve saved a photo on my phone), Iâ€™m carrying His love and faithfulness around with me everywhere I go, along with a box of tissue.